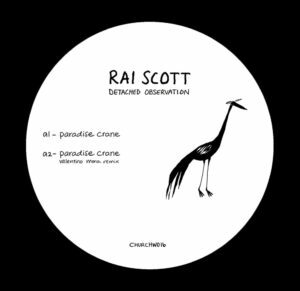 Rai Scott has created a series of tastefully resonating pieces of music for this latest release on Church. They grab hold of you and then expand your mind in differing directions. Perhaps that’s best via the melancholy orchestral pulses of Lazy Sunshine. Although, the intensity of Detached Observation with its rolling drums and swirling pads, or indeed the haunting disquiet of Paradise Crane both wrestle equally for your attention. There’s also a great remix of the later by Valentino Mora which teases and tears at the fabric of electronic sound in a most invigorating way.